Doki Doki Literature Club, a sleeper hit game by Dan Salvato, has all the hallmarks of an anime-influenced, cutesy visual novel. An awkward protagonist searching for love? Check. A high school setting? Check. A boatload of gorgeous, starry-eyed girls all competing for the protagonist’s affection? Check. This is so cliched, you might think to yourself during your first runthrough. You’d be wrong, though. Startlingly, horrifically wrong. Doki Doki Literature Club isn’t a game about romance – it’s a 2001: A Space Odyssey-style meditation on self-aware technology. It’s smart, it’s haunting, and it’ll keep you on your toes as you try to save the game’s characters… including yourself. You start the game as a loser at a Japanese high school: you don’t have many friends, and you spend all your spare time watching anime. One day, though, your neighbor Sayori persuades you to come to her new after-school club. (Sayori, of course, is bubbly, adorable, and devoted to you, even though you seem like a crappy friend.) The literature club only has three other members: Natsuki, a scrappy, plain-spoken manga fan; Yuri, a doe-eyed gothic horror devotee; and the president, Monika, a popular girl who also loves modern poetry. Oh, and they’re all super into you. Will you write your way into their hearts? the game’s Steam teaser text says. Heck yeah you will, because despite how selfish and bumbling you seem, you are a chick magnet. Except that the story doesn’t unfold quite right. Monika’s poems are disturbing, but she won’t explain what they mean. Natsuki doesn’t get enough to eat because her father doesn’t feed her. 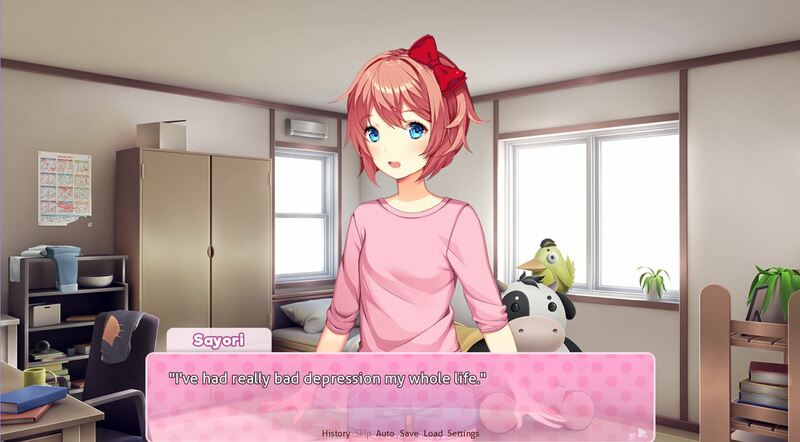 And Sayori – sweet, romantic Sayori – suffers from debilitating depression. By the time you’ve finished your first run, one of the characters is dead. The content warning about graphic violence and disturbing themes, which has seemed irrelevant so far, becomes necessary. 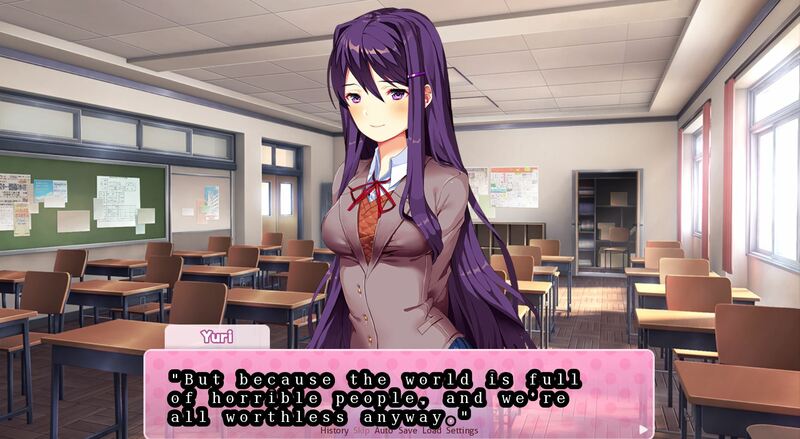 All these thoughts ran through my mind as I ended my first go at DDLC. I was freaked out, but not as freaked out as when I clicked back to the main menu. The girl who died? She was gone from the loading page art. Once I started another playthrough, I saw that she was gone entirely. None of the other characters knew who she was. After several hours, I realized that I wasn’t playing a game. The game had come to life, breaking established rules of gameplay left and right. The game was playing me. That’s what makes DDLC such a macabre delight: it masquerades as one genre, but at its core it doesn’t belong to any genre or type. It’s not a game that wows with graphics or soundtrack. The club members’ sprites are smiley, stacked, and leggy, visually interchangeable with a thousand other visual novel love interests. The backgrounds are forgettable, and so is the cheery, tinkling music. It’s all so forgettable that when things start to get weird, the mundane becomes terrifying. That’s all thanks to the writing, which is the true star of DDLC. Dan Salvato wrote this game in secret while he was getting famous modding Super Smash Bros and creating Twitch extensions. DDLC’s inventive, tech horror writing comes out of nowhere. I had complex conversations with each of the girls about what makes a good poem, and why people write, and how reading brings people together. They’re the kind of high-minded conversations an English teacher would die to have in their class. The writing is also laden with tension. As the four girls start to break down, they spin out of control in truly frightening ways. 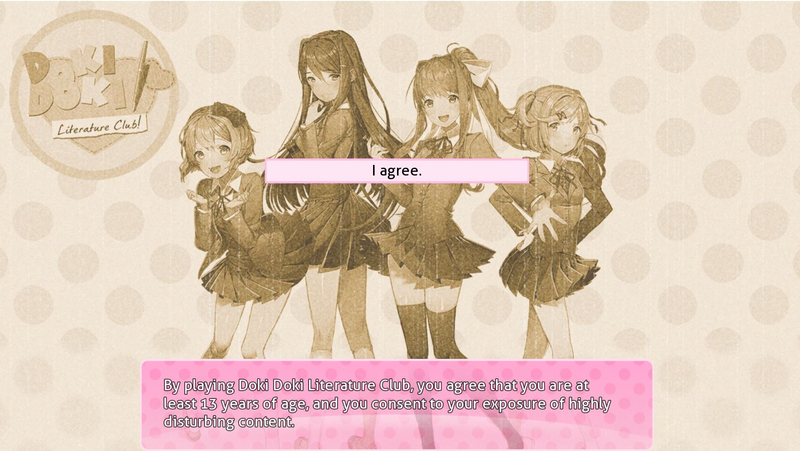 I can guarantee you that, by the time you’ve finished DDLC, you won’t be able to forget the club members. Just like Hatoful Boyfriend and Dream Daddy, Doki Doki Literature Club twists the tropes of visual novels for its own inventive ends. But where Hatoful Boyfriend and Dream Daddy are absurd, funny, and touching, Doki Doki Literature Club is chilling. It shows the power of bare-bones storytelling, like ghost stories around a campfire…if the campfire came alive, trapped you in the forest, and started telling stories, too. Doki Doki Literature Club is free to play on Steam. Previous ArticleVote Now For Game Of The Year 2017!